Our class went to the STEM Lab for the first time this year! We met our STEM teacher, Mrs. Wicks, who taught us that STEM is an acronym for Science, Technology, Engineering, and Mathematics. For our first lab investigation, we used the scientific method to learn how germs spread through contact. 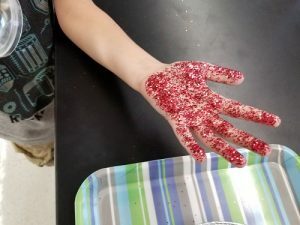 By using glitter to represent germs, each team of children started with only 1 color glitter on their hands. 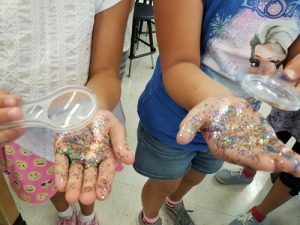 After shaking hands with children from other teams, they were surprised to find that the glitter on their hands had transferred (spread) to everyone they touched. What a powerful visual of how germs travel! 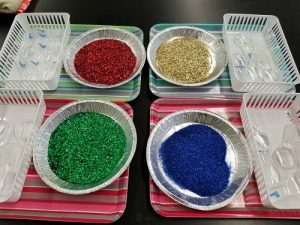 This entry was posted on September 22, 2018 and tagged STEM. ELA: Mondays at 8:15 a.m. Math: Tuesdays at 8:15 a.m.